The Lamar University Department of Theatre & Dance presents The Birds as their first production of the spring semester. The show will run from February 7-10 in the Studio Theatre, located on the campus of the university. The play is adapted by award winning Irish playwright Conor McPherson (The Weir, The Seafarer) and is based upon the short story, The Birds, by Daphne DuMaurier. A version of the story was turned into a film by Alfred Hitchcock in the 1950’s. The production is directed and designed by Grothe, along with Dave McManus and Cherie Acosta, both assistant professors of theatre, and features Lamar students Caitlin Grammer (Senior, Bridge City, TX), Emily Buesing (Junior, Vidor, TX) Chris Shroff (Senior, Thicket, TX) and Kalan Bonnette (Freshman, Orange, TX). The production is performed without an intermission and runs approximately 75 minutes. 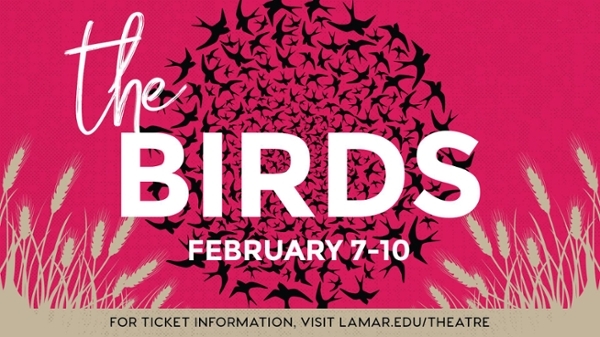 Tickets are on sale now for The Birds and can be purchased at www.lamar.edu/theatre. Prices range from $7-$15. Performances begin at 7:30 p.m. and the Sunday performance begins at 2:00 p.m.